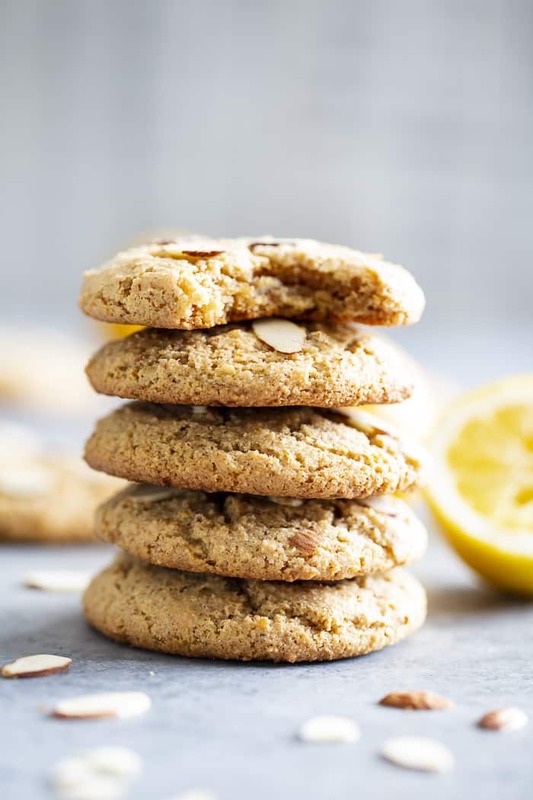 These chewy lemon almond cookies have tons of flavor and the absolute perfect cookie texture! They’re fancy enough to serve to guests and easy enough to whip up when a cookie craving hits. Paleo, vegan, gluten-free, dairy-free, and refined sugar free. We’re celebrating the first day of SPRING (eek!) with a recipe that is absolutely one of my favorites yet. And oh-so-springy, of course! 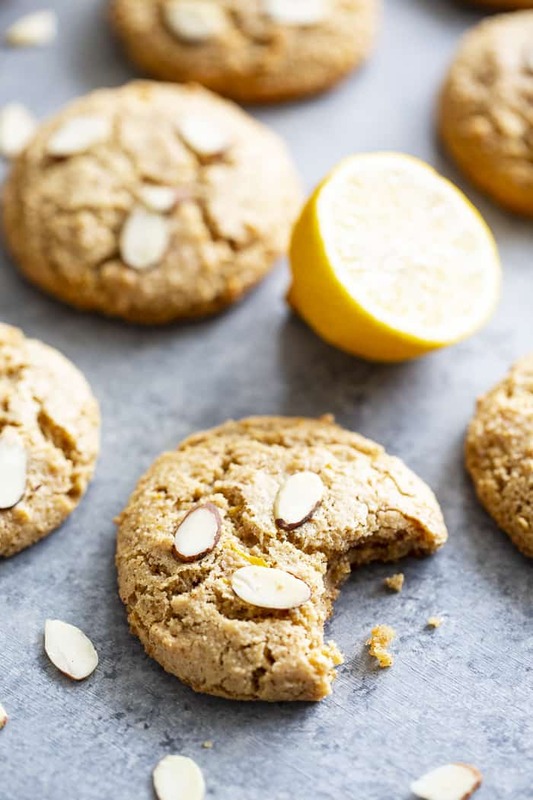 Chewy paleo + vegan lemon almond cookies that are so full of flavor, have perfect texture (yes perfect!) and will basically rock your paleo world in all ways possible. In other words, get ready for a serious treat! 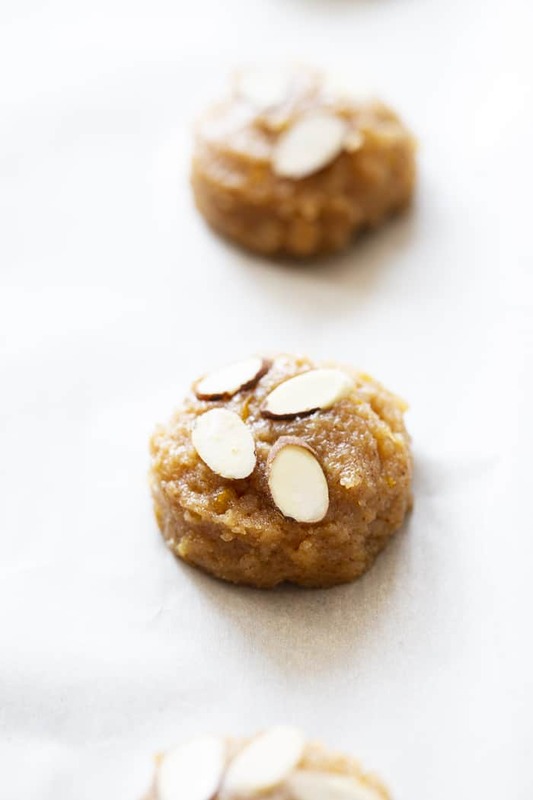 Way back when I stumbled upon a basic paleo + vegan cookie recipe completely by accident. I was trying to make cookie dough, failed, and decided to add a flax egg, bake, and see what happened. 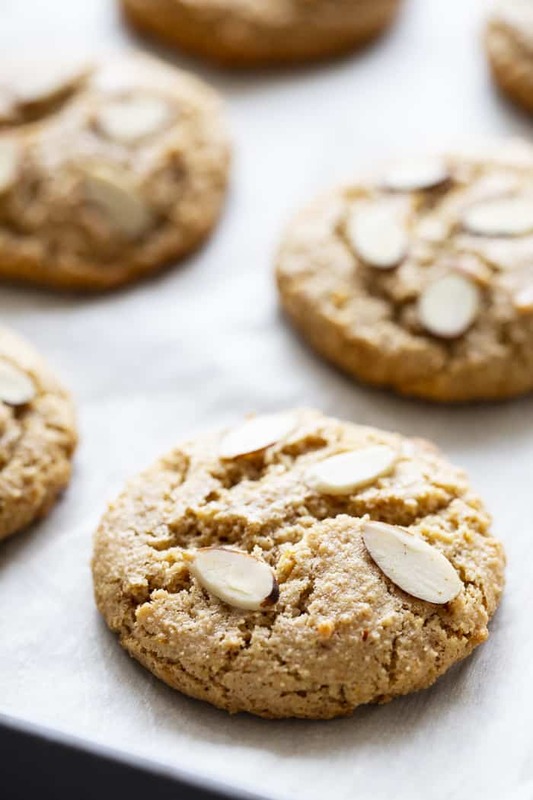 What came out of that experiment was these chewy “oatmeal” raisin cookies – and that was the beginning of a whole bunch of paleo + vegan chewy cookies that are seriously my favorite cookies ever. From the original ones, to these cranberry orange chocolate chip ones, apple cinnamon, and double chocolate chip mint cookies, I keep the basics, switch up the flavor, and I’m never disappointed! I guess based on how much I’m raving, you can guess that these chewy almond cookies are no exception, and you’re totally right. These are cookies you can confidently serve to non-paleo eaters and know they’d never know the difference! One note regarding the flaxseed egg. 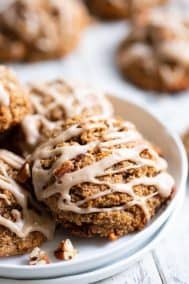 With all my cookies recipes that use flaxseed “eggs”, there is typically an option to use an egg yolk if you don’t wish to make them vegan. While that still technically holds here, I highly recommend you try them with the flax egg. The moisture, chewiness, and overall texture is just superior when you use the flaxseed instead of an egg yolk. If you do wind up using the yolk, I recommend pressing the cookies down before baking, since they won’t spread as much. The dough most likely will not need to be chilled either if you use an egg yolk. If you’re holding back on using the flax egg because it’s strange and intimidating – no worries – it’s actually extremely simple and requires no work. All you need to do is place 1 tbsp flaxseed meal and 2.5 tbsp water in a small bowl before you begin and allow it to sit there while you prepare the dry ingredients and preheat your oven. Yup, it’s that simple! As the mixture sits, it thickens and forms a consistency similar to that of an egg, and, you whisk it into the wet ingredients just as if it were one. 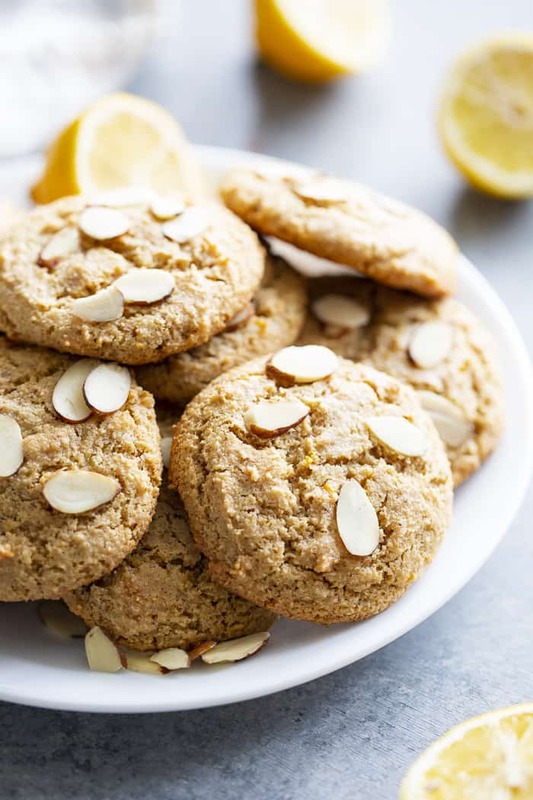 Let’s get our ovens preheated and our flax egg going, because it’s time to bake these seriously yummy lemon almond cookies – let’s go! Prepare the flax egg and set aside. Preheat your oven to 350 degrees and line a large baking sheet with parchment paper. Combine the almond flour, tapioca (or arrowroot), baking soda and salt in a mixing bowl. In a separate large bowl, whisk together the nut butter, coconut oil, maple syrup, maple sugar, flax egg, extracts, lemon zest and lemon juice until very smooth. Stir the dry ingredients into the wet until well combined and a sticky dough forms. Chill the dough in the fridge for about 10-25 minutes. Using a medium cookie scoop, scoop and drop dough about 2” apart on the parchment lined baking sheet - I made 12 cookies. 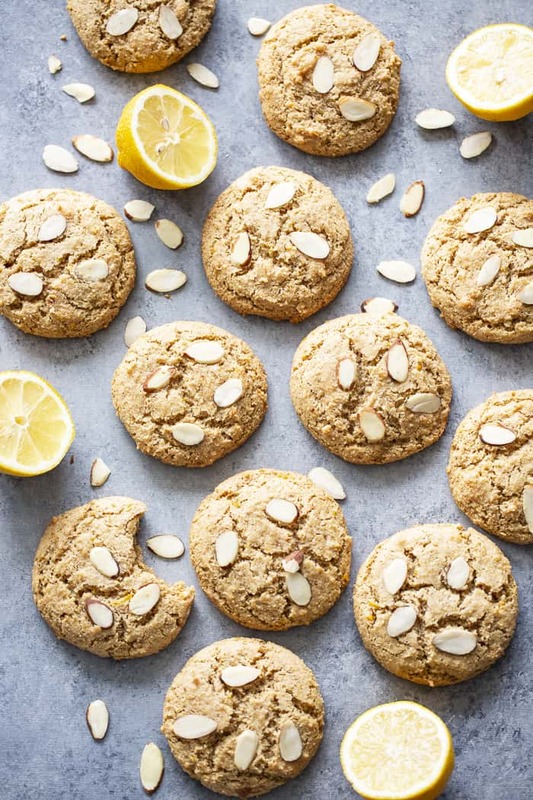 Arrange sliced almonds on the tops of the cookies, pressing the top of each cookie a bit as you go. Bake 11-13 mins until set and turning light brown. Remove from oven and allow them to cool 5-10 minutes on the baking sheet (they’ll be very soft), then transfer using a spatula to wire racks to cool completely. Cookies are best stored at room temperature, loosely covered for the first day. After a day or so, store them in an airtight container at room temp or in the fridge. Enjoy! *Although I highly recommend using the flaxseed "egg", you can also sub in an egg-yolk if you prefer. If you use an egg-yolk, you'll need to gently press the cookies down right before baking since they won't spread as much. 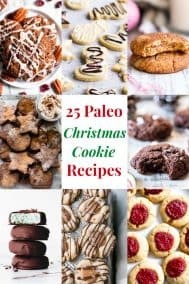 Want More Paleo + Vegan Cookie Recipes? Try One of These! These look so good and they scream spring! I love both lemon and almond flavors so I can only imagine how good this combo is. Yum! I am so grateful to have an egg free recipe! I will have to try these. These cookies look so delicious! 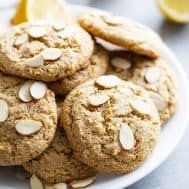 I love lemon and almonds together! HI! Can I use an egg instead of flaxseed? Would I use just one egg? Thanks. These cookies were top notch! Perfect! I made 19 cookies and they spread a lot with my medium size scooper – nice and big. Followed the recipe completely and did not disappoint me. Flavors were out of this world. Can you tell I REALLY liked them a lot. Baked them for 13 minutes and could easily take them off sheet after about 5 to drying rack. Can’t wait to try the other recipes! A REAL winner! 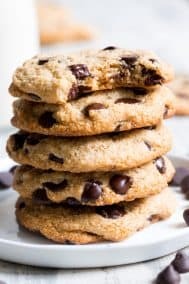 Wondering about the nutrition facts, are there 171 calories in 1 cookie or 1 serving (12 cookies)? Even my dad loved these cookies! He is very picky!